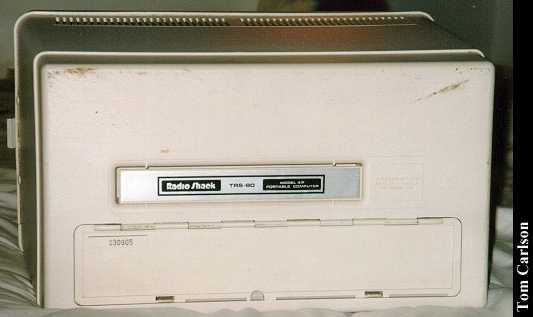 This is Tandy's luggable version of the TRS-80 series. It's actually a little smaller than most luggables. It also has a really nice clean design. 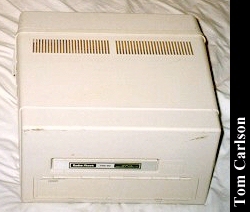 The ports on the rear of the unit are protected by a panel. The handle is sunk into the case when not in use. The screen is pretty clear and sharp as well. Rather than running CP/M like any other luggable, it runs TRS-DOS. I think these were also available with an internal hard drive. 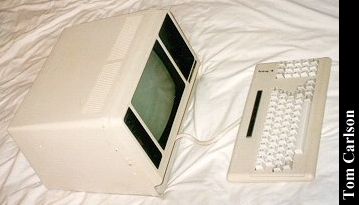 Side view of the TRS-80 Model 4P. Rear view showing the top as well. Rear view. The shiny label is actually the carrying handle. The various ports are hidden behind the door below the handle. View with the door on the rear open. 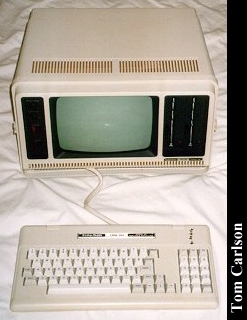 Click here to view all comments for the Tandy TRS-80 Model 4P and to leave your own.